I’ve set up my pile for winter as best I can. It’s got all the makings it needs – layer upon layer of dead plant stuff mixed with an array of juicier, biodegradable organic material — to fuel the composting process that will take place deep inside my pile through the short days and long cold nights ahead. Today, the last Saturday before Christmas, is when autumn turns to winter. For much of recorded history, the winter solstice — the day with the shortest period of daylight and longest night of the year — was marked by celebration, a time for feasting on the fatted calves of summer and the fermented grape and grain of the harvest fall. A final blowout before the start of famine season. As the day marks the reversal of the ebbing sun, it also signifies a new beginning, the reawakening of nature, rebirth. Pagans celebrated the Yule holiday, and sacrifices were given to the gods to earn blessing on the forthcoming germinating crops. Our modern “midwinter” holiday, with its Christmas trees and yulelogs, is a direct descendant of those customs, and I’m OK with that. But it can hardly improve on the idea behind the oldest known construct honoring the winter solstice: Newgrange, a neolithic structure in Ireland built around 3,200 BC. A large mound, built of alternating layers of earth and stones, with grass growing on top, the monument’s entrance is aligned with the rising sun on the winter solstice, when sunlight shines through a ‘roofbox‘ and floods the inner chamber. It’s called Ireland’s greatest national monument, and it’s all to celebrate this day. If my pile had the weight and significance of Stonehenge, it would be Newgrange — in 5,000 years. I make the best use of this short day with a quick trip over to the beach with the dog and bring home a big bucket stuffed with the straw of salt marsh grass. I’ve gathered a pail full of kitchen scraps from the neighbors’ next door and set it beside my own smaller plastic canister of spent coffee grounds, chopped-up vegetables, broken egg shells and dinner-plate scrapings. Votive offerings were found in the inner chambers of Newgrange, and I will add these new offerings to my pile in kind. Another neighbor, the older couple who lives on the western side of my property, had asked a few days ago if I could take the decorative pumpkins from their front stoop. They’ve long since served their symbolic purpose of the harvest season and Halloween, and it would be a waste to consign them to the trash when they could contribute their rotting plumpness to my pile. My son and I already have a supply of freshly roasted pumpkin seeds culled from our own porch set and tossed the rotting husks into the heap. Today I finish up the the season of giving thanks by smashing up the neighbors’ pumpkins and chunking them into my pile as well. Pumpkins are a most welcome addition to my pile. A member of the Cucurbitaceae family, which also includes squash, cantaloupes, cucumbers, watermelons, and gourds, the pumpkin has been cultivated for a thousand years or more, first by Native Americans in the Southwestern United States, but today is grown mostly in the Northeast, and mostly near big cities to cater to the Halloween market. The practice of decorating and lighting hollowed-out pumpkins and setting them on doorsteps to ward off evil spirits stems from an Irish folktale about a man named Stingy Jack, a tradition brought to these shores by immigrants uprooted by the potato famine. Long Irish story short: Jack was a drunk who successfully battled his demons but couldn’t quite make it to heaven. The Devil tossed him a lit ember straight from Hell — a bone, given Jack’s past shenanigans — and Jack placed it in a hollowed-out turnip to help light the way on his endless wanderings. In all, 1 billion pounds of pumpkins are harvested in the U.S. each year, says the PennState Extension. Though I’m heartened by the fact that the season’s other decorative ornament — the Christmas tree — is often recycled, the fate of millions and millions of these pumpkins is, like that of old Stingy Jack, less certain, which is why I like adding their orangeness to my pile late each fall. Pumpkins are high in fiber, vitamin A, and like most vegetables, more than 90 percent water. Despite their heft, or perhaps because of it, their remains disappear without a trace in my pile but add measurably to it. Using the hay pitchfork, I hollow out the top of the pile, exposing a steamy layer of moldy leaves. The buckets of kitchen scraps disappear into the mix, and I use a spade to shovel in about half of the pumpkin shards. I cover the lot with pitchforks of salt marsh grass hay, teasing apart the stalks with the tines so that the stems cover the top of my pile. Onto this springy bed of straw go the rest of the pumpkins. The bright orange rinds and mushy strands of flat pale seeds disappear as I twist the pitchfork deep into the mix. With the start of winter just days away, it’s time to say goodbye to the signature symbol of both Halloween and Thanksgiving — pumpkins. I cover the pumpkins with two bedsheets of damp maple leaves dragged over from my neighbors’ backyard. Once again, the cover-up is complete, and my pile is largely on its own, left to its own devices. The inner workings of my pile are largely a mystery to me. Even soil scientists are still profoundly uncertain about what exactly takes place, biologically, underneath our feet. Michael Pollan and other close watchers liken soil to a frontier more unknown that the deep oceans or outer space. The humus that my pile produces is in many respects terra incognita. I consider composting more a craft project than lab experiment. I am happy to let my pile do its own thing, with a certain amount of input and creative direction. That said, both the art and the science of making compost is well-developed and readily available, whether it’s from a book shelf at the library or simple online search term. The University of Illinois Extension website, Composting for the Homeowner, provides a compendium of useful tips and academic research that seems clear, credible and worth sharing. There are many other such academic “extensions” of knowledge online and elsewhere about compost, including a few store-bought books that stock my own shelves, ranging from the earnest how-to guide to more free-form ruminations from ‘70s commune types turned cottage-industry composters. 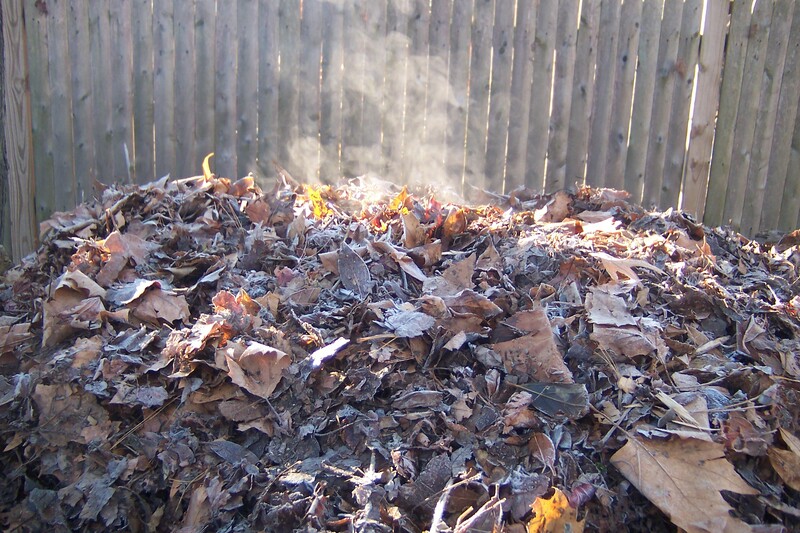 While my pile gently heats, I explore the research and literature about compost. The more I learn, the more I realize I’m less a deus ex machina than silly old wizard behind the curtain. The more I think I do for my pile, the more I realize it will do its own thing anyway. Here I thought I was the master of the domain that is my pile. Not true. I am only the minder. 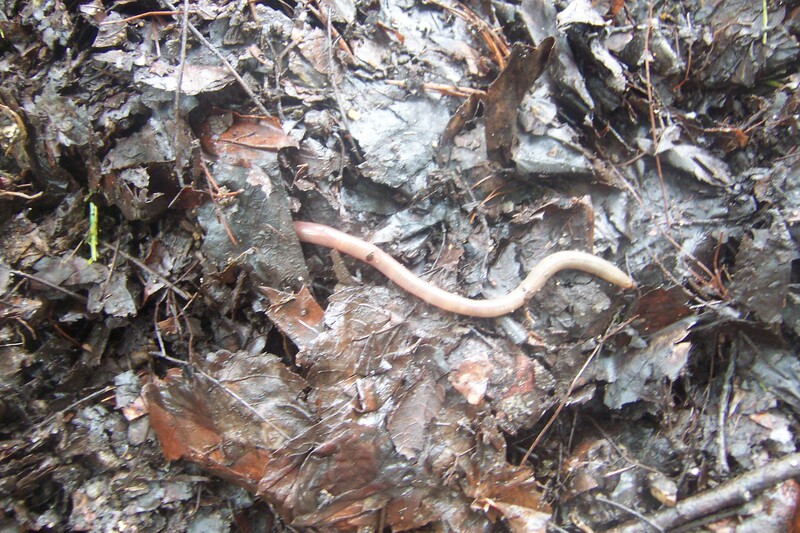 Charles Darwin knew that earthworms were the real movers & shakers. My pile on a frosty morning in December. What’s going on in there?! There is much more that the Extension has to say on this subject, but at this point in the season my place in the ecosystem that is my pile is clear: My pile needs me to help keep it on a slow burn as long as I can with a judicious, even artful blending of energy, air and water. Otherwise, my pile is just a big mess of leaves cluttering up my backyard. And what good is that?